From little Tali Lake to the mysterious Burial Crypt, adventure surrounds the tiny Pikalese village of Popowon. The sparsely populated area holds long hidden treasures and unusual new worlds of danger. Any adventerer wise enough to solve the 500 year old Riddle of the Barrow Mounds will claim the greatest reward of all. 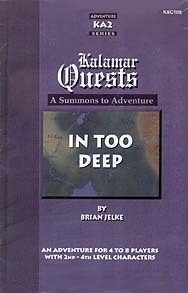 The In Too Deep Kalamar Quest adventure and supplement is designed to provide both a challenging adventure and useful supplementary campaign material. The material within is set in the popular Kingdoms of Kalamar fantasy campaign setting but can easily be used with any fantasy role-playing game setting.